Not being one who wants to die with lots of toys, I selected these products from the reviews and with the intention to try things out. This iPad Air* was a gift to my Father from my sister. My job was to outfit the iPad Air* for him. My Father had used the iPad Air without the screen protector for 1 week before I installed this film for him. He found no difference and it did not effect handwriting Chinese input method. He noticed no change in the image quality. Installation was pretty easy for me. 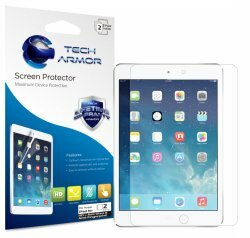 I started by watching all the installation videos Tech Armor provided on their site. I did not install it in the bathroom as suggestion by some. I suggest you find a clutter-free area and remove dusts in the area as much as you can. Once you have it positioned, the film lays itself down nicely. I used the sticker they provided the remove the dust particles. Do remember some might be stuck on the film rather than the screen. 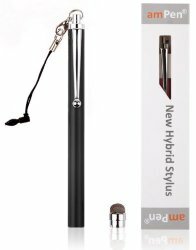 I bought both amPen Hybrid Stylus and amPen Capacitive Stylus. He picked Hybrid right away. The Capacitive was definitely not as good. The Hybrid reduced the frustration of the screen not responding to his touch. It works even with the Tech Armor HD ANTIGlare Screen Protector. Handwriting Chinese input seems to work better using his finger. For older folks’ viewing pleasure, this adapter can be hooked up to a TV with HDMI inputs. Whatever you see on the iPad will show up on the TV screen, control still comes from the iPad. I’ve heard that, for this, it’s better to get an Apple made part. For what he needs, Apple TV was not necessary. You will also need a HDMI cable to go between the Lightning Digital AV Adapter and the TV’s HDMI input. Be sure to measure the length you need before selecting the cable. This entry was posted in I Found This and tagged iPad, screen protector, stylus, tv adapter by n2n. Bookmark the permalink.